Minority Report and Iron Man-type interfaces are already here — you can control your computer’s functions from a wall or tabletop or just by waving a wand in midair. It’s amazingly affordable if you use a Wii Remote and an infrared (IR) light pen. How do you get an IR pen? You make it! In 2007, Johnny Chung Lee invented the Wiimote whiteboard. As Lee explained in his runaway YouTube video, every Wiimote has a high-resolution IR camera. To turn it into a mouse or an interactive whiteboard, we connect it to a computer, fix it in one place, and use movable IR pens within view of its camera. An IR pen is a simple device — basically a flashlight with a momentary pushbutton and a high-power IR LED like you find in TV remote controls. Most people use a dried-up dry-erase marker as the body of their pen, but performance is spotty because the LED points out the end of the pen, not straight at the Wiimote camera. So I designed a big IR pen with the LED pointing out the side, and turned it into a small business. It’s the longest IR pen in the world! What can you do with your IR saber? Anything your computer can do, except bigger, better, and more badass. 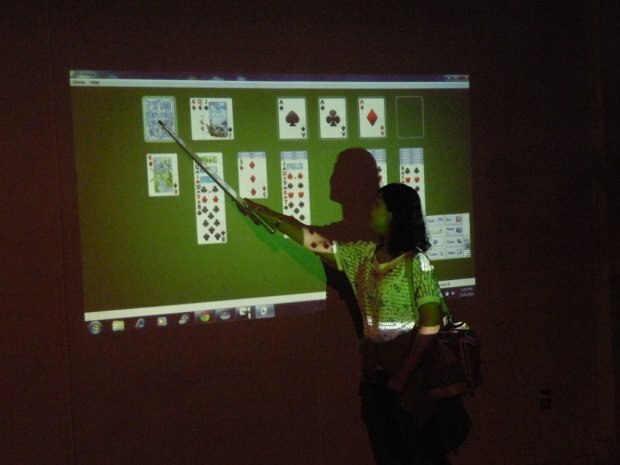 Create a free PC theremin, play chess or solitaire on your wall, or browse family photos and internet videos. Have a fake laser battle with your kids, teach a class, or give a presentation. You can even build two IR sabers and do multipoint whiteboard control. I show how to set up my Smoothboard system in my videos atyoutube.com/user/Shakespeare1612, and there are lots of tutorials and software online for similar “Wiimote whiteboard” setups. Enjoy! On Make: The Cortado, an Arduino you´ll never plug in.